Jeffries may have been the Great White Hope a century ago, but his replacement, Donald Trump has amassed a far better record. After he knocked out 17 wannabees in the Republican Presidential primary, he scored a TKO over the first woman to seriously approach the ring. Donald “Agent Orange” Trump hits his foes below the belt, even when the referee is watching. He has a mean head fake. You can think you caught him in any of the hundreds of lies he spews weekly and he will manufacture a new tragedy to make you forgot the most recent misdeed. When it comes to pre-fight hype, he makes Muhammad Ali look like an amateur. Trump is always a sore winner because victimization is the game he excels in. One day though, Donald “Agent Orange” Trump, like all fighters, is going to hit the canvass. The crowds will turn on him, and the debt he owes to Queen Karma will have to be settled. Be leery, because that day is coming soon. Trump can’t be content winning, so who knows how unhinged he’ll be when fatigue and frustration take him to the mat. 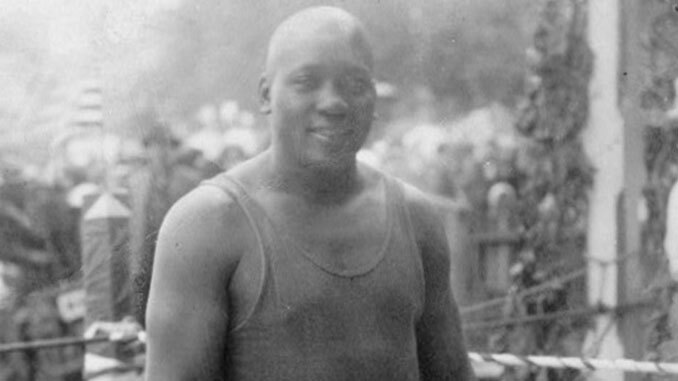 Jack Johnson finally lost to the only unbeatable force in the United States of America; racism. Oddly, racism will turn on Trump and consume him as well. It was “Mighty White” of Donald to pardon Jack Johnson the question is who will pardon this Great White Hope.